I’ve been to hundreds of Chinese restaurants in my days. They seem to be everywhere in the States, with Chinese entrepreneurs setting up shop in every shopping mall or available street corner. In many cases, the primary attraction of a Chinese restaurant is the buffet. After paying a nominal sum, you line up to gorge yourself on fried rice, eggs rolls, wanton soup and sweet and sour chicken. Before coming to China, I had heard that the food here is completely different than the “Chinese” food found in America. That statement is as true as the statement that the Red Sox won the World Series this year (GO SOX!). We’ve been here for a month and haven’t spotted one plate of General Tso’s Chicken or Moo Goo Gai Pan (actually, I’d pay an untold sum for some General Tso’s Chicken right now, especially after the bland, and somewhat disgusting, meals Shanna and I have endured at times). In fact, we’ve been completely shocked at how little rice we’ve seen consumed. You practically have to beg for rice at most restaurants here – and soy sauce? forget about it. You might as well be asking the waiter if you can drink your tea out of the holy grail. The one item I’ve seen at Chinese restaurants in the States that I was confident I would find in Beijing is roast duck (or, as we call it back home, “Beijing Duck” or “Peking Duck”). You can find Peking Duck at many Chinese restaurants in the US. Unless you go to restaurants that specialize in Peking Duck (like the wonderful Peking Duck House in New York City’s Chinatown where I recently took my mom, who has become quite an adventurous eater in recent years), you may have to order your duck a day or two in advance. After a little research, we discovered two restaurants that were reported to excel in roast duck in Beijing – Dadong Roast Duck Restaurant and Li Qun Roast Duck Restaurant. The former, Dadong, is an upscale joint that caters to wealthy Chinese and tourists. The white tablecloth restaurant is huge and gorgeous. There must be a staff of a hundred catering to your every need. Once your duck arrives, a chef dressed in white meticulously carves the roasted goodness right in front of you. The second restaurant, Li Qun, has a completely different environment. Hidden in the hutong (the old, historic neighborhoods) south of Tiananmen Square, Li Qun has a very rustic feel. There are only a handful of tables and you must call in advance in order to ensure a duck has begun the roasting process. A diner looking for immaculate conditions in their dining experience would be better off heading to Dadong. 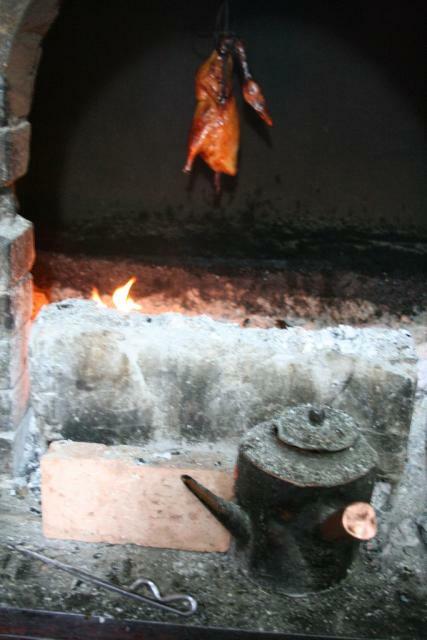 The process of eating duck is the same at each restaurant. 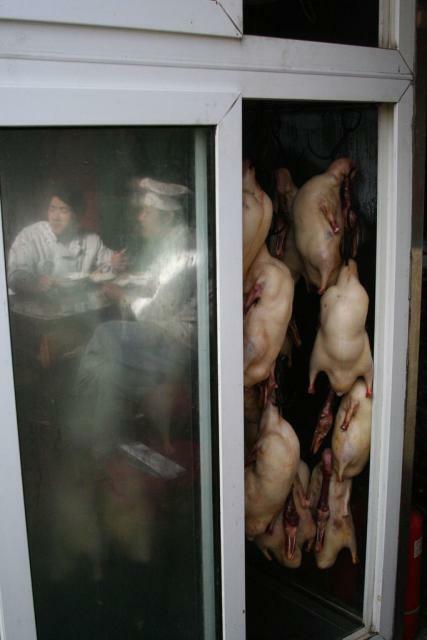 The duck, including the duck skin, is sliced in front of you. You might think – duck skin? Isn’t that disgusting? Actually, the crispy duck skin is easily the best part. Keep in mind that I also think fried pork skins are a culinary delight (which have been so slandered by high-browed diners that I prefer to eat them in solitude for fear of judgment). 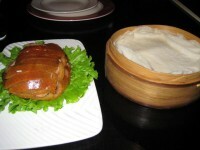 The sliced duck is accompanied by, at a minimum, three items – “pancakes”, sliced scallions and hoisin sauce (a delicious plum sauce). The pancakes are thin, translucent and round; they have very little taste as they are primarily used as a vehicle for consuming the duck. Similar to making a fajita, you stuff the pancake with duck, scallions and hoisin sauce. 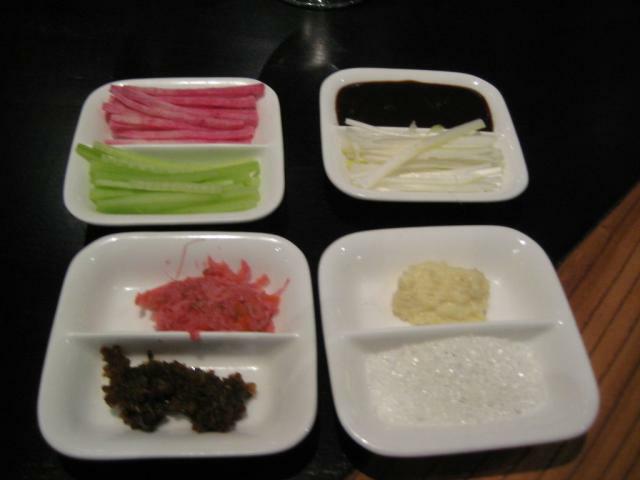 In some cases, additional items are available including sliced cucumbers, garlic paste and sugar (a crucial item, in our opinion). The stuffed duck pancake is nothing but fantastic. After comparing the two restaurants, we couldn’t choose a favorite. While we liked the upscale atmosphere at Dadong, we also appreciated the old-school charm of Li Qun. The duck was exceptional at both. 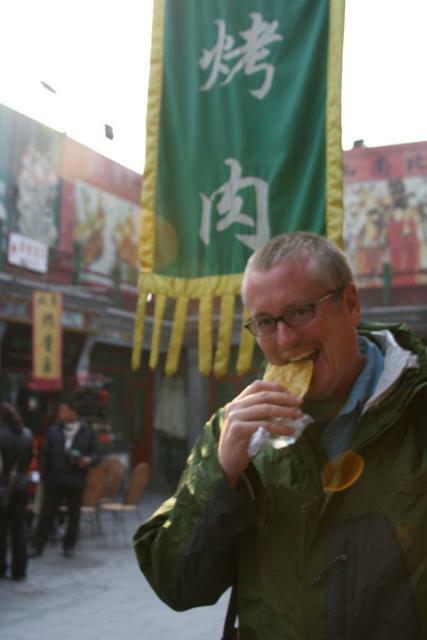 In virtually every guidebook you’ll read about China and other developing countries, there is a section describing the dos and don’ts (well, mostly the don’ts) of eating. Cardinal sin number one in many books is eating the street food – that is, food sold by vendors that you can find on virtually every street in Beijing. If you haven’t already guessed it, I don’t follow their advice. 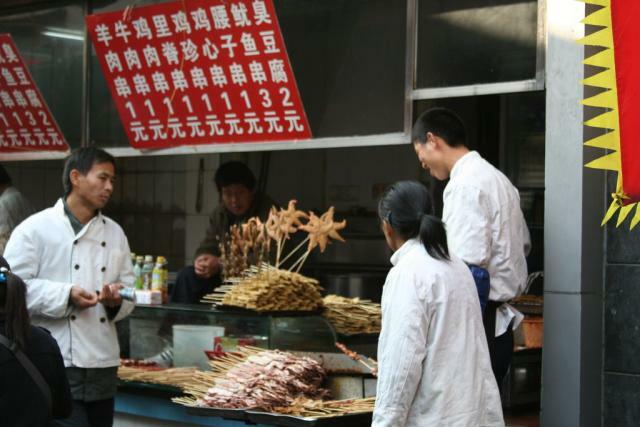 Street food is the essence of a city’s cuisine. If you ask New Yorkers what their favorite dining memories are in NYC, a surprising number will tell you about a hot dog vendor on the Upper East Side or a gyro stand in Midtown. I’m sure there are ongoing debates among the Hispanic immigrants in Nashville as to which taco truck on Nolenseville Road dishes out the best tacos (in my non-Hispanic opinion, the taco truck parked in a parking lot on the right side of Nolenseville Road just north of 1-440 is the best). A substantial number of a city’s residents rely on these vendors to fill their belly on their way to work in the morning, to provide a much-needed snack during the afternoon or to provide a quick and cheap dinner after a hard day’s work. If you love food, avoiding street food in a city is akin to an artist visiting Paris and skipping the Louvre. There are, of course, a few guidelines to follow. You can’t just dive into the first beef skewer that’s being cooked on a makeshift grill on a side street because the downside of bad street food (especially in Asia, where the “facilities” are not quite 5-star in most places) can be so bad as to require professional counseling upon your return home. Follow the Crowds. If the locals are lining up to sample the offerings, you should be fine. Not only do you have the natives’ seal of approval that the food is not poisonous and is probably delicious, you have better assurance that the food hasn’t been sitting around for hours (or days…). Is it Clean? If the vendor takes pride in keeping his stall or cart clean, there is a better chance that he cares about the safety of the food. Many people have an assumption that the kitchen at a restaurant is always better than street food, but you usually can’t see the kitchen at a restaurant. For all you know, there is a local colony of rats residing behind the kitchen door. With street food, it’s all out in the open. Do Your Research. Try to find out the local delicacies of a city before you get there. Not only will you get to sample the best the region has to offer, you’re more likely to get sanitary food because you’re eating what the locals eat (and not something the street vendor has cooked for an unknowing tourist). Know Your Limits. Not everyone’s stomach has superpower bacteria-fighting abilities. 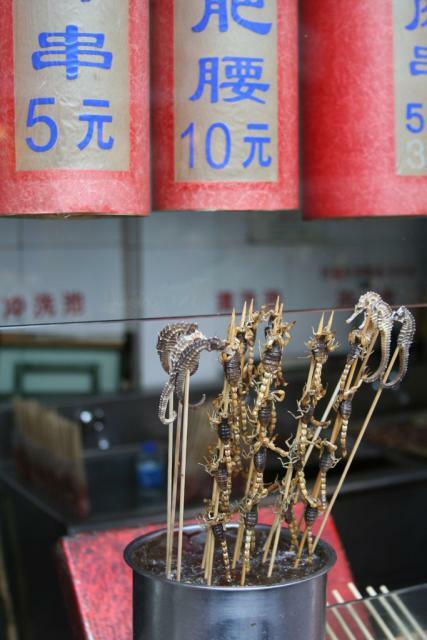 Even though Johnny is calling you a sissy while he downs a grilled seahorse (as we saw in Beijing the other day), you may want to stick to the fried noodles with vegetables. Small Doses. The beauty of eating street food is that you can sample lots of different items because, in many cases, the street vendors huddle in groups. If you pig out on one item, you may not leave room for that delicious fried caterpillar right down the street. Relax. If you’ve traveled across the globe to visit an exotic land, don’t dampen the experience by always playing it safe by eating in the tourist restaurants or the local McDonald’s. You’ll miss out on some great food and even better stories. I’ll take this over Eggs Benedict any day! Around the world, there are many different styles of eating. Due to our famed individualism, Americans are accustomed to ordering our own meal at a restaurant and rarely sharing with anyone else at the table, unless that person is our significant other (in which case we will sometimes share, but begrudgingly). This style of eating is virtually unheard of in the East. In Asian restaurants, a variety of dishes will be ordered (in many cases, the ordering is done by one person – sometimes with input from others) and the items will be brought out and placed in the middle of the table to be shared by all (for Southerners reading this, think “family-style”; for Nashvillians reading this, think “Monell’s). To me, there is no better way to eat. By ordering multiple dishes, you get to try lots of different flavors without envying the entree ordered by a fellow diner. One of my favorite types of “family-style” ordering is “dim sum.” I first sampled dim sum when I was in Hong Kong in 1996 and, since then, I’ve sought it out in various places (especially at the Golden Unicorn in New York’s Chinatown). 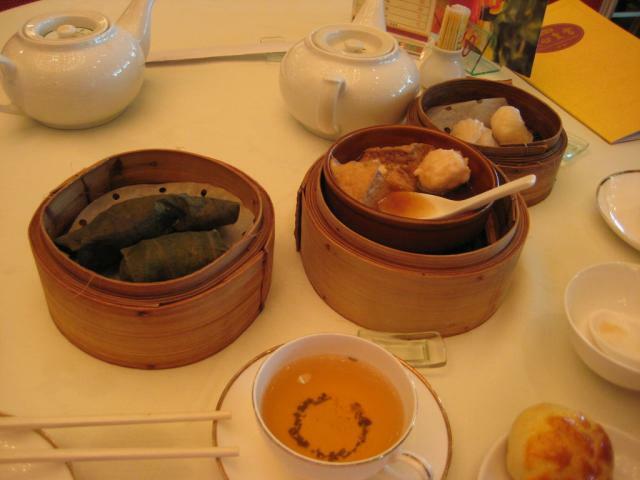 For those who’ve never experienced dim sum, it is a style of eating famed in Hong Kong and the Canton area of China which takes place mostly on weekends during “brunch” time. While Americans have their omelettes, eggs benedict and french toast, the Chinese sample steamed dumplings, “shumai”, pork buns, chicken feet! and hundreds of other small dishes. 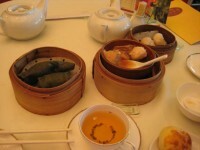 In many places, the various items on offer at a dim sum restaurant are wheeled around on a small cart. As the cart goes by, the names of the dishes are yelled out by the cart-pusher (or if your Chinese is lacking, or in my case nonexistant, the cart-pusher will take the cover off the dishes to show you what’s underneath). If you like what they have, you point to the item and it is placed on your table. The cart-pusher marks a card on your table with what you ordered and heads off to the next table. The food, which is served as small dishes (sort of like Spanish tapas), is generally amazing. I’m especially fond of the shumai and the pork buns. 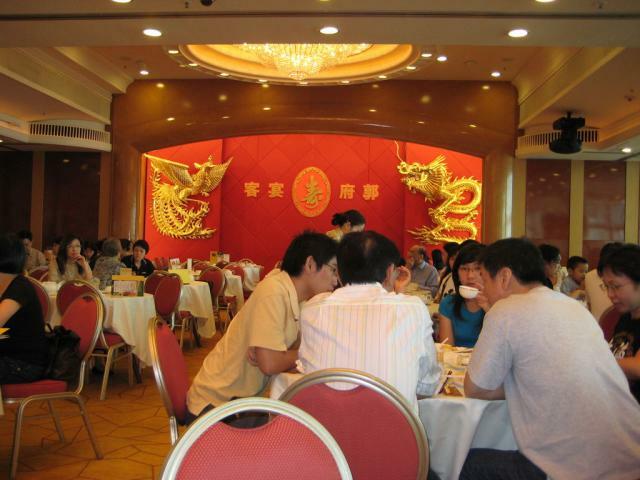 While in Hong Kong, we sought out Maxim’s City Hall Palace – a restaurant that’s supposed to serve some of the best dim sum in the world (and, based on some awards on the wall, the best in Hong Kong). The restaurant was packed, requiring a wait of about an hour. Once we were seated, however, the foodcarts immediately made it our way where we ordered quite aggresively. I was getting embarrassed with how much we had ordered until I looked around and saw that all the other Chinese diners where ordering even more than we were. After finishing off several pots of jasmine tea and eating more dumplings than I care to admit, we left the restaurant and decided to take a long walk in downtown Hong Kong to help burn off the amazing feast. We arrived here last night and checked into the Hotel Continental, which–at about $33 (or 108 Malaysian ringgit) a night–is affordable and comfortable and passes my new test for our lodging: its shower is more than simply a spigot on the wall. (My need for a self-contained shower perhaps means that I’m not a true backpacker but, hey, we all have our limits…) As luck would have it, the Continental is right next door to the Red Garden, a night market that offers a mix of locals and tourists all kinds of Malaysian and Chinese food, as well as regular karoake performances. Having skipped lunch, we were all too happy to partake in the food stalls’ offerings, from dumplings to crabs to prawn noodle soup (the best on Penang island, according to the sign). After a quick hotel breakfast of noodles, rice and cereal (there’s something here for everyone), we boarded one of the trishaws that move comfortably on the streets here, despite the fairly unregulated flow of trucks, cars and motorcycles. Our driver, Jetty, turned out to be a great tour guide, and he pedaled us from our Georgetowwn neighborhood to Penang’s bustling Chinatown, through Little India and then to the British colonial area. (History lesson – Malaysia is a former British colony that became independent 50 years ago; Penang was a major trading stop between India and China due to its location in the Melaka Straights, explaining the majority population of Chinese and Indians in Penang). Along the way, we stopped at Khoo Kongsi, an elaborate, colorful Chinese “clan house” that used to serve as a meeting house and temple for a certain Chinese family or clan, but now is predominately a musuem and tourist attraction. We then wandered through a tiny fishing village doomed to be destroyed in the coming years by the construction of a new highway. Next, we visited the wildly colorful, Sri Mariamman Hindu Temple. Finally, Jetty (who is fluent in 4 languages, English among them) took us to Fort Cornwallis, the site of Penang’s first British port. Derek and I then meandered back into Little India for a delicious vegetarian lunch at the Madras New Woodlands Restaurant. If you ever find yourself there, I highly recommend the channa batura, which is essentially a larger-than-your-head piece of fried bread accompanied by a spectacular garbanzo bean curry. We then explored the city on foot (one of our favorite activities), stopping in various Chinese temples and seeing other remarkable sites until we came across a tiny shop in Chinatown, where we had what has to be one of my favorite experiences so far on our trip. Picture us for a second: we’re standing on a little side street in Chinatown. We’re clearly foreign, and we’re overloaded with 2 cameras, a Malaysian guidebook and various bags. I would not want to hang out with us. We’re looking in this little glass case at the front of the shop, trying to determine the contents of some frisbee-sized packages wrapped in paper. The proprietor of the store joins us on the street and explains that they’re packets of Chinese tea. She then invites us to the back of the store, where we join her, her husband (who, as it turned out, spoke 6 languages) and a local customer on little stools in front of a small table that holds a number of tiny teapots and an electric kettle. Over the course of the next 90 minutes, the proprietor and her husband served us countless cups of Chinese tea (green, black and oolong) in tiny teacups. With occasional translation from the other customer (who was around 19 and will study accounting in Kualu Lampur starting next year), we discuss various aspects of life in Penang and talk a little politics (both Malaysian and American). When, over-caffeinated and full of life, we’re finally ready to leave, they press a big container of freshly sliced watermelon into our hands and refuse to accept any money from us for the watermelon or tea. Incredible. Indeeed, our time so far in Penang has been much like our experience in the tea shop. Surprising, different and wonderful. Nearly everyone here speaks English (excepting a 20-year, prime minister-caused lapse starting in the 80’s, it’s taught in all of the schools here) and, because it’s the low season, we have many of the more popular tourist attractions nearly to ourselves. Everyone we’ve met here so far has been incredibly kind to us, but not in a way that is overbearing or revealing of any motive other than simple friendliness. Tonight, we plan on having a drink at the historic Eastern & Oriental Hotel and then, per the recommendations of our teahouse friends, we’ll have dinner at the Golden BBQ Steamboat Restaurant before trying to go to bed early since we have to leave for a flight at 5:15 a.m. Perhaps we should go take naps first. UPDATE – the Golden BBQ Steamboat Restaurant was a wild experience. It was a style of eating that combines Mongolian Barbecue and Fondue. Basically, you choose what you want to eat from a huge buffet of uncooked meats and vegetables and cook them up on a pot and grill in the middle of your table. It was delicious and overwhelmingly filling. I’ve had a passion for food that has bordered on gluttony for many years. To feed that passion (pun intended), I’ve always sought out new restaurants and types of food – from elegant meals in 5-star restaurants to a $0.50 curry dish on the streets of India. For me, a trip to Paris is pure heaven. The restaurant I’ve most looked forward to in Paris was A Beauvilliers, a small, old French and absurdly romantic restaurant in the Montmartre district recommended by a former colleague of mine who also has the food affliction. This is the kind of place where you shouldn’t even look at the prices on the menu since you know they’re outrageous; luckily, the restaurant partially assists in this area. When we sat down at 10:45 p.m. (jet lag is still fully intact), Shanna and I were each handed a menu. As I was perusing my menu, Shanna asked on 3 separate occasions where the prices were located. After telling her the location 3 times and starting to wonder if I had really made the right marriage decision, I finally looked at her menu and realized that the restaurant had given her a menu without prices – a patriarchal effort on the part of the restaurant to reduce the heavy burden a woman must feel when presented with financial decisions. I doubt this practice is alive and well in many American restaurants. From that point on, I requested that Shanna only talk when spoken to unless she’s talking about raising babies, cooking dinner for me or cleaning the kitchen. Surprisingly, Shanna rejected this request. We ordered from the prix fixe menu, where you order an appetizer, entree and dessert from a variety of choices – a style of ordering that gives you a cheaper price than if you ordered all 3 dishes separately but mainly a brilliant effort on the part of the restaurant to trick you into ordering dessert since there’s no way you would ever do so after stuffing yourself with the appetizer and the entree. Since the menu was only in French and Shanna dropped the ball on learning the language on the plane, we basically ordered our dinner by pointing randomly at the choices presented. This method proved very effective. The highlight of the meal for me was braised beef (a dish that tasted like your Mom’s roast beef on crack), covered with a wheel of perfectly-cooked potatoes and some sort of foam (that, we’ve learned, comes standard with almost all fancy Parisian dishes). The other dishes included asparagus soup, trumpet mushrooms and sea bass (served almost rare – the only way to eat fish this good). One of the desserts included 2 small chocolate cakes with a warm, chocolate center that oozed out of the cake once we dove in. Needless to say, we were without words for several minutes. The food was almost upstaged by the service. Our waiter was working so hard that he was visibly sweating – not a visual highlight of the meal, but indicative of the attention we received. At one point, Shanna tried to pour a glass of water from the mineral water we ordered (as a side note, it seems no one drinks tap water in Paris, but instead doles out at least $7 each meal for a bottle a water; the Nashvillian in me wanted to reject the bottle on a couple of occasions and instead order a glass of the “Cumberland River’s finest” or, more appropriately, the “Seine River’s finest”), but was quickly scolded by the waiter who practically yelled, “I work; you no work”. When people ask me about my favorite dining experience, I never have a single answer. There have been so many great ones – the tasting menu at Le Bernardin in New York; the beef brisket at Kreuz’s Market in Lockhart, Texas; the soup dumplings at Joe’s Shanghai in New York’s Chinatown; a cheeseburger on French Bread at Rotier’s in Nashville; the shrimp noodle soup made by an old Vietnamese lady (wherever you are, God bless you) on a side street in Saigon. Without hesitation, I can say that our dinner at A Beauvillier will quickly come to mind the next time that question is asked. Although we arrived in Paris only yesterday, Derek and I have already begun to understand what Hemingway meant when he called this city a “moveable feast.” Finally liberated from our pre-wedding diets, we have spent the last 24 hours in a near-constant state of consumption. As I write this, we have just wiped away the baguette crumbs from our makeshift picnic on the wrought-iron balcony of our room in the Hotel de Grands Hommes (about which all of the spectacular reviews on tripadvisor are, indeed, true). We have a room overlooking the Pantheon, an ancient building that Derek has fallen in love with. We spent yesterday afternoon wandering the narrow streets of the Rue de Mouffetard and, of course, pausing to indoctrinate ourselves into the French lifestyle via a Nutella-filled crepe. Following a touristy-but-still-cool cruise on the Seine, we joined throngs of Parisians in line at Le Relais de Venice , where the waitress, when she arrived to take our order, asked us only a single question: “rare or medium rare?”. Nothing more was needed, as there was no doubt that we, like all the others, were there for the steak frites (aka steak and french fries), a French classic. True to their reputation, the steak and the frites were both extraordinary, as was the meringue/chocolate concoction (with the greatest chocolate sauce ever created by man) that followed. Jet lag and recovery from our wedding-related sleep deprivation meant that we didn’t rise this morning until well after our guide book’s recommended hour of 8:00 a.m. (Waking up this early apparently allows one to take in Paris’s most famous sites while avoiding most other tourists. It is a theory that we will never test.) We wandered into Guy Savoy’s Les Bourguinistes for a late lunch, during which we ordered–and then devoured–everything on the prix fixe menu. Among the stars of the show were my soup (labeled “carrot,” but more aptly described as “butter”) and Derek’s duck , which, as best we can tell given my still-limited language skills (the studying on the plane could only carry me so far), was drizzled with fig sauce. We’re now preparing (yes, we’re still hungry) for a 10:00 dinner at A Beauvilliers. (Jet lag allows us to eat as late as the actual residents of this city.) While our bellies are certainly rounder than they were last week, the ill effects of our binging are somewhat lessened by the fact we’ve been walking all over the city. Today’s jaunts took us to the Pantheon (which is located about 200 feet from our balcony), the Palais de Justice (where we happened upon a trial for drug possession in full swing–incredibly interersting even despite the language barrier), the amazing stained glass windows of the Sainte-Chappelle, a quaint flower market and, of course, the Notre Dame, where we lit prayer candles (a candle burns in Paris for you, Uncle Larry) and ascended the 387 steps of the church’s North Tower to see Paris from a completely different perspective. I’m currently reading Elizabeth Gilbert’s “Eat, Pray, Love.” In one chapter, Gilbert hypothesizes that every city can be summed up with a single word (so, for instance, Nashville’s word might be “musical,” while Detroit’s could be “recovering”). The people who most enjoy a city are those who can be described with the same word. On our walk back to the hotel this afternoon, Derek and I decided that we and Paris currently share a single moniker: “splurge.” Perhaps that explains our love affair with this town. We have just returned from what can only be described as one of the best meals of our lives (a label not given hastily, given all we’ve been eating since we arrived here). I know there’s a book called French Women Don’t Get Fat. French women must not eat at these restauarants.